Mormon Wookiee: #72: The Marvelous Missy Franklin. I love the Olympics. I love the spectacle, the competition, the patriotism, and even the commentary (yes, I actually do think Bob Costas is great, despite all the complaints people are making about NBC). However, my favorite part of the Olympics is the inspiring stories of the athletes. This week has had no shortage of inspirational stories: Michael Phelps' all-time record of 19 medals, Jordyn Weiber showing the resolve to come back and win team gymnastics gold after missing out on the individual finals, and British diver Tom Daley competing with composure despite the recent death of his father, among many others. 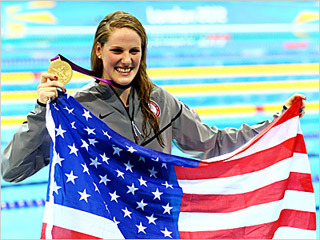 My favorite Olympic story so far is that of 17-year old USA swimmer Missy Franklin. Missy Franklin winning her first Olympic gold medal. Everything about Missy Franklin makes me feel good inside. I admire her contagious smile and endless enthusiasm, her pure joy when she wins (two golds and counting! ), and her grace and maturity when she loses. Her good example makes me want to work harder to achieve my goals and never set limits on my potential. However, even greater than her abilities as a swimmer, Missy is just a great person. When she started to achieve great success as a teenager, Missy didn't move to California or Florida to become a part of a great swim program. No, she stayed in her home state of Colorado because she was happy there and didn't want to leave her friends or long-time coach. When she started to receive national attention, Missy didn't accept every sponsor that came her way; no, instead she refused them so that she could continue to compete on her Catholic high school swim team in Aurora, Colorado (site of last week's tragic movie theater shooting). When you watch Missy, you can tell how much she loves God, loves her parents, loves her friends, loves her sport, and loves her country. I, for one, can't wait to see what her future holds. Good luck, Missy! I completely agree with everything that is said here! She inspires me to reach further in my goals and never give up on my potential! Thanks Missy!! !